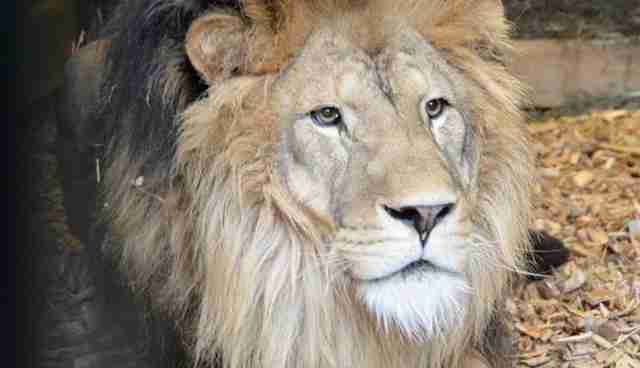 Bella was Malawi's most famous lion until Simba came along. Bella's arrival in 2009 was covered extensively by TV channels and newspapers around the world and over 30,000 people visit her each year at Lilongwe Wildlife Centre, a rescue and rehabilitation centre that since 2007 has taken in and released hundreds of orphaned and injured wild animals. When we got Bella, she was our first lion, and little wonder that she was lonely. In the wild lions live in prides and among cat species, this is unique. Within their prides, lionesses are mostly related, typically working together to hunt and kill for their families. It was imperative then that Bella get a friend soon and Simba seemed like a good bet. Simba's story, like Bella's was not a happy one; he had been confiscated from an animal trainer in France in October 2012 and had been living in a temporary home in Belgium since then. Bella, herself a rescue from a run-down zoo in Romania had been living alone and distraught since 2006, after her mates and cubs succumbed to disease. The gentle Simba, with his magnificent mane, seemed to everyone to be the perfect match for Bella and together with the Born Free Foundation and the Natuurhulpcentrum Sanctuary in Belgium we began working on the lengthy process to bring them together. We all imagined the two would be delighted to be so close to each other, but alas, the path to love is not always so smooth. Initially Bella seemed quite happy to see Simba but soon her interest and curiosity started turning to aggression and her purrs became snarls. Bella has skeletal problems as a result of a poor early diet, when she had been used as a photographer's prop by gypsies in Romania, and she only had one eye, having lost the other to glaucoma. With only limited vision in her remaining eye, perhaps Bella felt vulnerable, and was sending signals to Simba, who was twice her weight and size, that she was no push over. Whatever her reasons, she was effectively intimidating Simba. 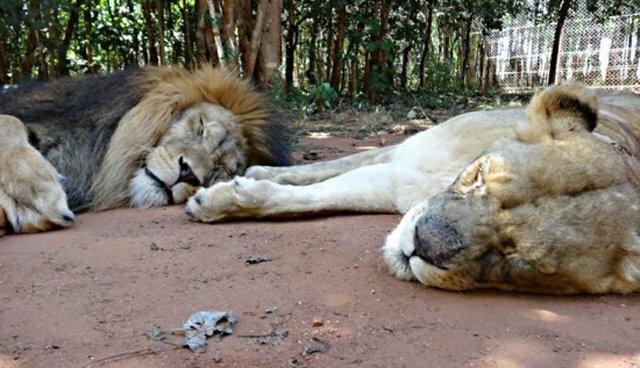 Initially Bella and Simba had been living alongside each other, separated by fences - Bella was frequently aggressive towards Simba and he was clearly nervous of her. We knew it was unlikely they would bond straight away, but as the days went by the team became impatient for a thaw in Bella's hostile stance. These lions had been lonely for too long. It was three months before the team at LWC decided to allow them together. 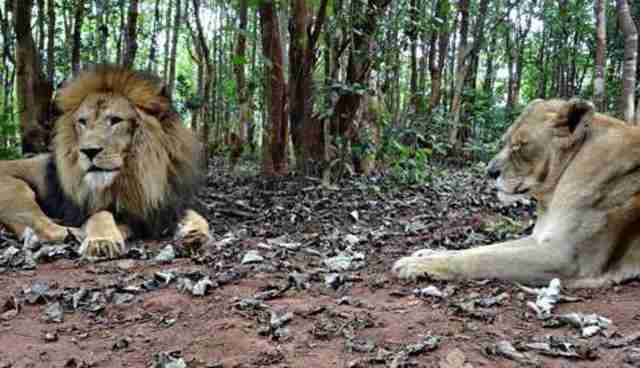 Finally, the doors were opened between them this April and Bella came face to face with another lion for the first time in five years. We thought there might be a fight and we got one: Bella attacked Simba, and to his credit he did defend himself. It was a spine tingling encounter but all over in less than 10 seconds, and the pair separated. Bella's hostility didn't diminish though, and Simba was clearly nervous around this strange lioness who was now stalking him. Fortunately Bella started to come into season and her whole attitude changed. To Simba this was equally unnerving, having Bella now rolling invitingly on the ground in front of him, and trying to lick him! Not quite sure what to make of all this, this big 350 pound lion retreated to his indoor quarters and wouldn't come out. 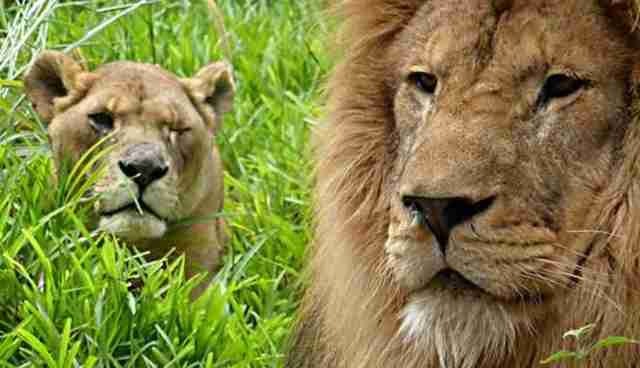 On May 24, Simba's hormones started to make up for his lack of experience and he mated with Bella for the first time. That night, under a sky bright with stars, they remained outside together for the first time. The next day Bella and Simba were seen relaxing and dozing together. For two lions who had suffered greatly previously, this was the new beginning they finally deserved. Lilongwe Wildlife Cent is open to visitors all year round from 8am to 5pm. Contact info@llwc.org, go to www.lilongwewildlife.org for more information.